I received this watch as a gift from my father in law. 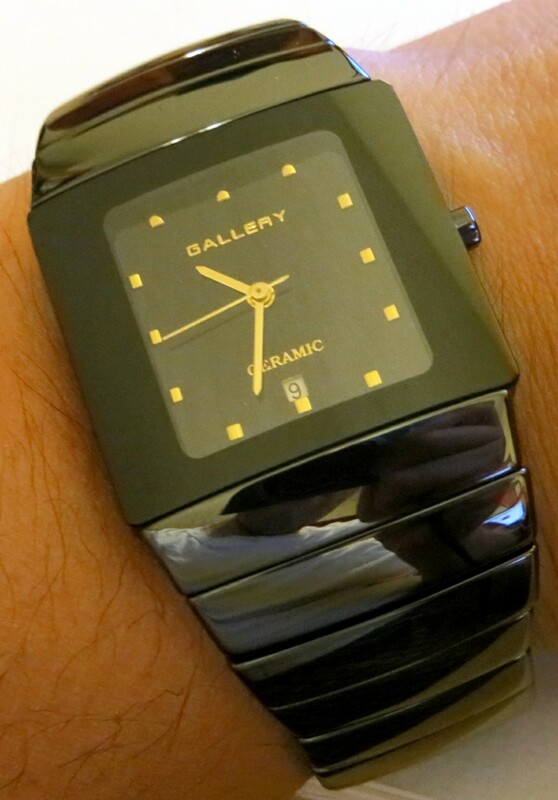 It is a Gallery all ceramic watch, which is an homage to a Rado Sinatra watch. The entire watch is ceramic with a sapphire crystal. The dial of the watch is a simple black, with gold rectangular hour markers. The hour and minute hands are gold plated tapered stick design, and the seconds hand is a simple stick as well. The rectangular case limits the length of the hands. The case is 32.5 x 31mm. There is a small date window at 6 o’clock, with a white date wheel. The crystal is thick, lightly domed sapphire and flows into the integrated bracelet of the watch. The dial is framed with a black bezel, there is no minute chapter ring. There is no luminous material. The dial is simply marked Gallery and Ceramic. Overall the dial is clean and the time is easy to read in most lighting. The case is all ceramic, including the case back. The back in held in place with screws, something which is unique in my collection. The back is laser marked, Gallery All Ceramic, Sapphire Crystal, 3ATM water resistant, Japan Movt. This homage to Rado does them proud, since they used similar, scratch proof materials. Rado has always specialized in scratch proof watches, including using tungsten and all ceramic watches. The Japan movement indicates this watch has a Seiko or Miyota quartz movement, I will take a look when I do the first battery change and update the review then. So far, the accuracy is very good, gains about 10 seconds a month. The crown is interesting, ceramic hexagonal shape and is easy to use. The date is quick-set when pulled to the first position. Unsigned, but I would not even know how you could sign this crown. The deployant is two button with no safety lock. It hides very well and is signed with Gallery. The entire bracelet exterior is ceramic. 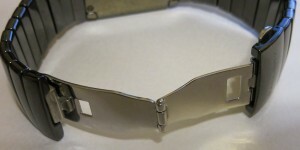 The inside has stainless steel links that hold it together. It was surprisingly easy to re-size and is pretty comfortable. A point to mention is that is has not shown any desk wear, which is typical of steel and gold watches. This is an interesting watch. I only have one other rectangular watch, so it is a good addition to the collection. The watch has a very good heft and feels well made. It is an homage to a classic watch, so you can’t go wrong. It looks like an expensive bracelet when worn and still looks like brand new. Movement: Japan Made battery quartz, maker unknown.